In Naivasha Maximum Security Prison in Kenya, a handful of law students sit amongst over 2,000 prisoners. The long hours of reading lengthy text books, the moments of doubt in less than ideal conditions, and the results nervously awaited, are almost forgotten now. These students have just passed their exams and will graduate with their law degrees [LLB] from behind bars. They are among our first 60 students to study law via distance learning. Altogether at least 14 students - including one from Uganda and 2 from Kenya’s Class of 2017 - will graduate from the University of London in 2019 as part of our Justice Changemaker Programme. A significant achievement for each one of them under very challenging circumstances and an inspiration for those to come. Particular congratulations are due to Pascal Kakuru, one of last year’s LLB Graduate who has just qualified for his Postgraduate Certificate in Law, a further step towards his Masters [LLM]. Through our Changemaker Programme we provide training, services and opportunities for prisoners and prisoner staff to grow in legal awareness, to learn how to support others, and to study law. 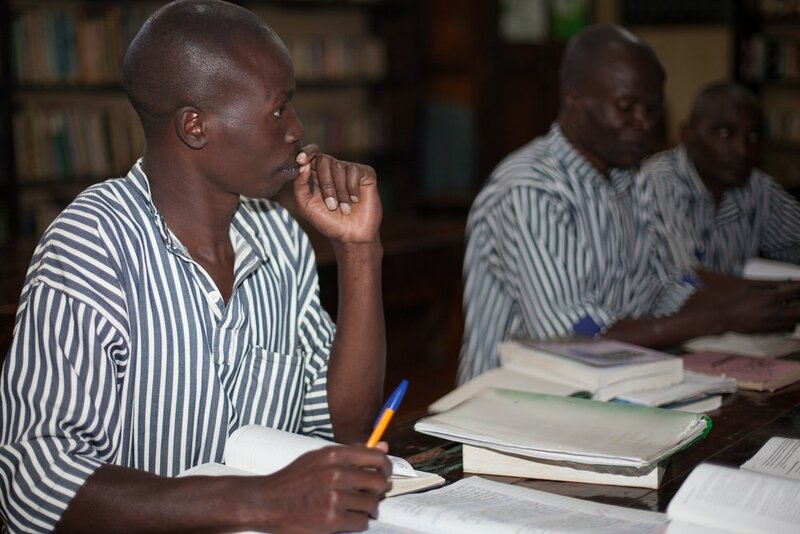 Prisoners and staff enrolled within our programme work under the supervision of practicing lawyers to provide free legal advice to others in the prison community as auxiliary paralegals. They make use of moot courts to practise their legal skills, giving them the confidence and experience they need, as well as learning how the court system works ensuring cases are well-documented and prepared for trial. In Uganda - where APP was recently awarded the Award for Participation and Collaboration by the Uganda Justice Department (JLOS) - members of APP’s community shared its work with key stakeholders. Pascal Kakuru and Paul Kakubi, both prison law students and paralegals, were given the opportunity to address the many distinguished guests and assembled inmates. Pascal shared how APP’s prison-based programmes providing free Legal Education, Legal Skills Training and Legal Services were becoming a force for change and a route through which the most vulnerable and marginalised within society could best access justice. Female inmates - specially admitted into the all-male upper prison for this event - had their concerns heard too. The plight of female offenders with children, the significant case backlog accrued by the courts, and regular failure to consider the effect of any past history of domestic violence on the guilt or sentencing of female offenders, were issues raised for serious consideration. As part of November’s legal awareness sessions within Kenya’s Kimiti Maximum Security Prison, the paralegals were joined by Morris Kaberia, whose sentence had been overturned on appeal, after 13 years. He spoke with the inmates and gave them hope to explore the legal chances they have. In response to this, one of our students - Wilson Kinyua, former death row inmate and current APP law student at Kamiti Prison - has been given permission by High Court judges to act as an intermediary in court and speak on behalf of prisoners who do not have lawyers. With more than a dozen students graduating next year, and many more to come, we’re excited about the potential for change. Our justice systems around the world are overstretched and under-resourced. Our commitment is to see those who have experienced injustice for themselves, become the ones to ensure access to justice is within reach for all.